How beautiful are these lace mantillas handmade by my friend Clare? Each one is exquisite and she even has liturgical colours too. 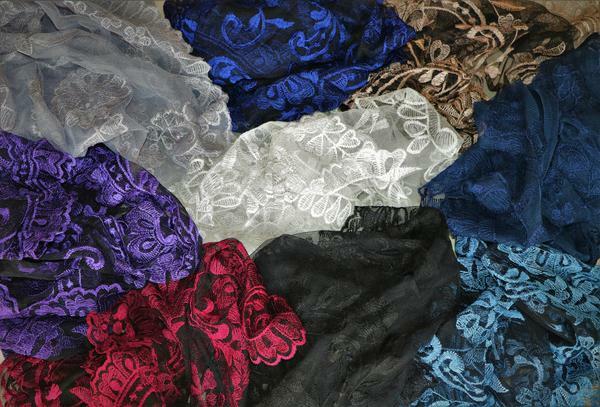 Please view her wonderful website http://www.diclara.co.uk/ and see the array of mantillas. This is one of the few shops in the UK selling mantillas. Much as a lace mantilla looks gorgeous on a baby girl, the likelihood of it staying on for more than two seconds into the Holy Mass would be nothing short of miraculous! The classical baby bonnet is the perfect alternative and there are a vast range of magnificent bonnets to attire baby in for Church. A beautiful white lace bonnet with white silk ribbon tie...this will stay on baby's head and teach her modesty too. Another lace bonnet with trim and tie. 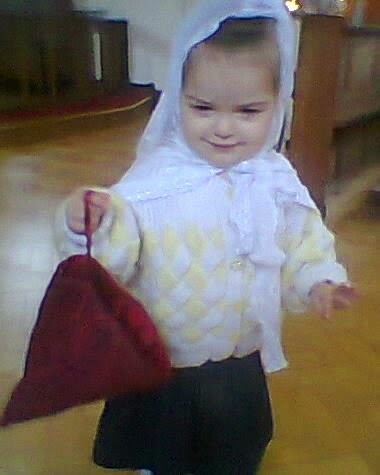 Baby Anastasia in her dark green wool with red velvet trim bonnet at Mass. This is handmade by Elizabeth Dulston of 'Zelie's Roses', address on the right hand bar. My brand new baby God daughter, Rose, at her Baptism. She wore a beautiful satin lace bonnet. Baby Rose again modelling another bonnet of white cotton her Mammy couldn't resist buying, and doesn't she look stunning? 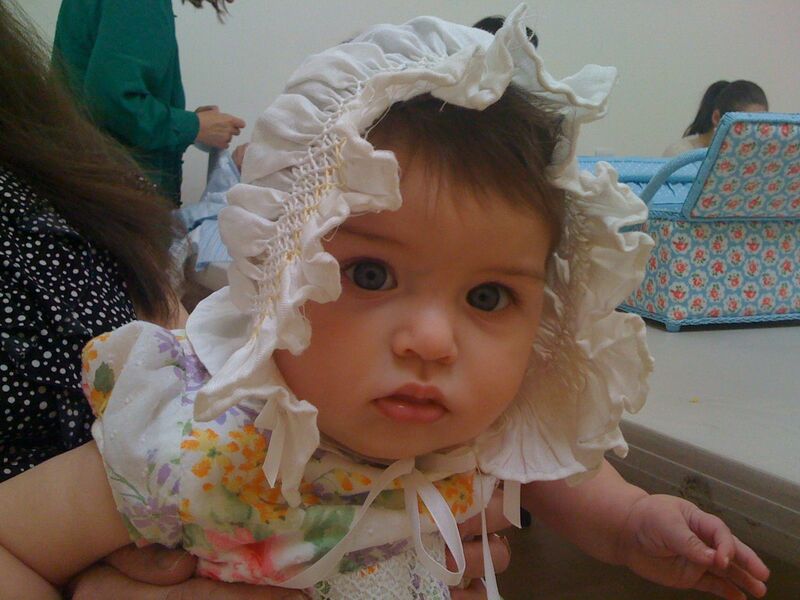 Baby Grace Therese wearing a hand made smocked bonnet her older sister made for her. A bonnet like this is perfect for Mass and will last for a couple of years. Another adorable bonnet from 'Zelie's Roses' in blue floral cotton with blue ribbon. I am very blessed to have a beautiful little 4yr old daughter called Grace Therese. She was diagnosed with JRA (Juvenile Rheumatoid Arthritis) at 3yrs old and has accepted and coped with her illness in a heroic manner. She has been in hospital four times for treatments and has suffered much pain. So this post is dedicated to her and for my immense love, honour and admiration for such a beautiful child of God. Jesus truly blessed me when He sent me Grace. Grace with her dear Godmother, Kathryn, on her Baptism. Grace was wearing a handmade bonnet by Zelie's Roses. 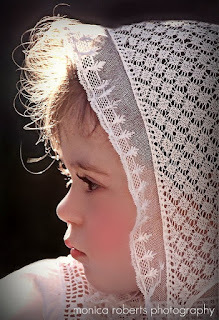 Little Grace wore a lace mantilla as a baby. 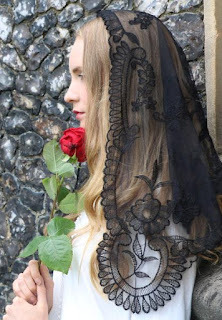 She is wearing an ivory vintage mantilla from Etsy. Handmade white lace mantilla from a friend. On the Oxford LMS Pilgrimage at Benediction. White lace mantilla from Chapel Veils. Oxford LMS Pilgrimage the next year, wearing a cream lace mantilla. Corpus Christi flower girl just after a procedure in hospital. Yes, even Grace's baby dolls wear mantillas! This was made by Zelie's Roses. Pale blue, for Our Lady, lace mantilla by Etsy. Mama and Grace at a Holy Baptism, Grace wears her white lace mantilla, I am wearing a long black one from Spain, so authentic! My two precious daughters, Marie and Grace. Both mantillas from Etsy. In Holy Mass in Lourdes where we have just taken Grace. I am wearing a vintage black and gold lace mantilla by Etsy. Grace has a new mantilla from Lourdes, it has Lourdes written on the back, with a picture of Our Lady and St Bernadette, couldn't resist this one! 'Everything is Grace' St Therese, the Little Flower. Mantillas or head coverings of any kind help us keep our eyes towards Heaven. There are a multitude of different styles, colours, fabrics and prices. 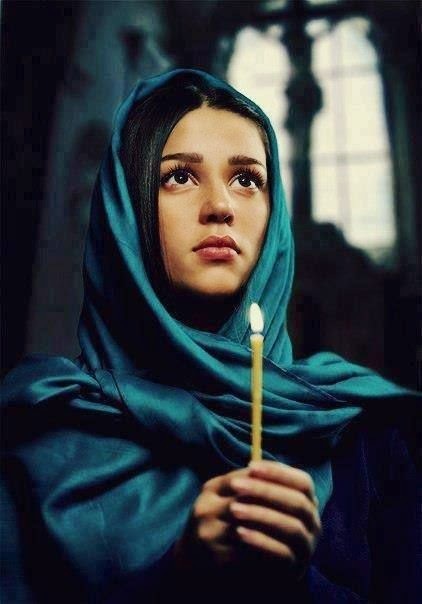 It really does not matter what we place upon our heads but the act of covering our hair when entering a Church shows reverence towards God and submission to His Holy Will. It also allows for more concentration when praying as the veil enshrouds us and provides some privacy. A very simple scarf works just as well as a plush lace mantilla. It is modest and feminine, allowing the lady to keep her mind upon her Lord. 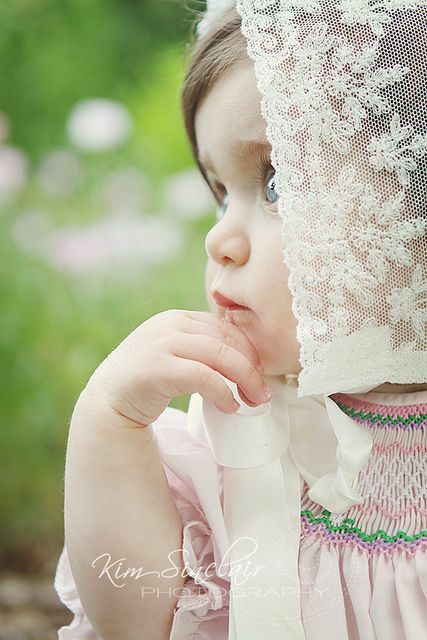 This little girl wears a delicate, pale blue lace mantilla from Etsy. 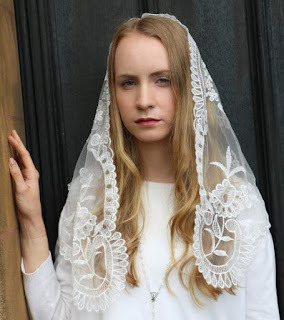 Classical white lace mantilla for a young, unmarried lady. 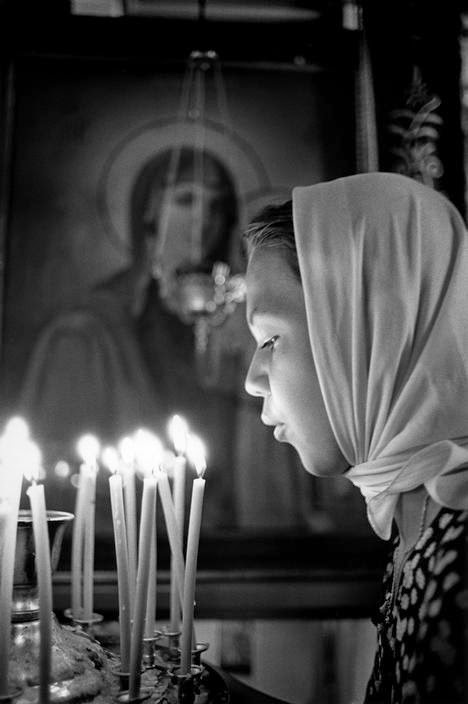 In the Russian Orthodox Church many women choose a simple white scarf to cover their heads. A Jewish head covering where a colourful scarf is tied tightly around most of the hair. A majority of ladies still wear the classic black lace mantilla. 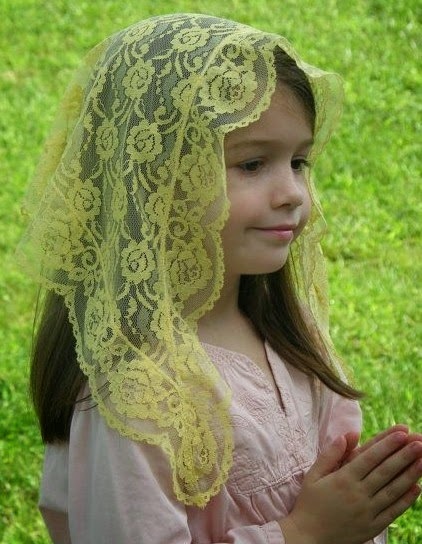 Little girls will only want to wear a mantilla for Church if their Mothers lead by their example. 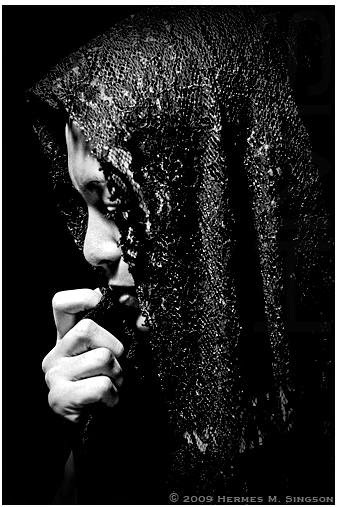 It is not just the wearing of the mantilla of course, it is the reason behind it, and this often shines through from the Mother onto the child. Sheer love for God, the knowledge and understanding that He is among us, that we are little, He is King. 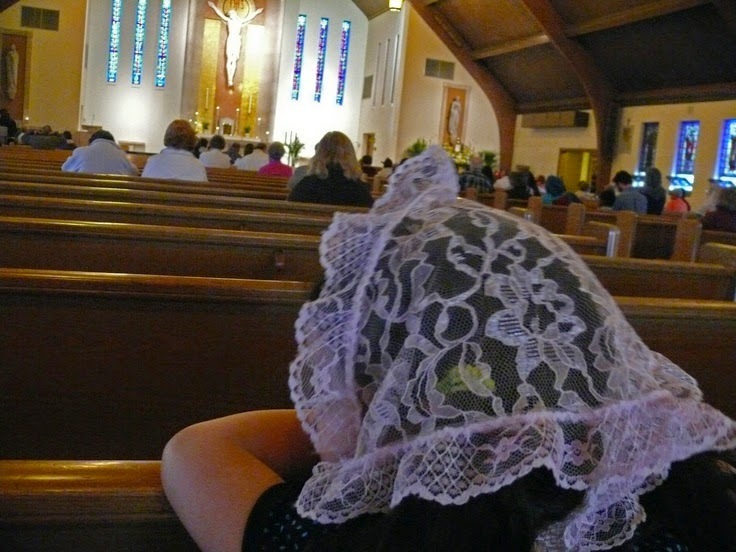 A mantilla helps a little girl to feel reverent, like modest clothes do too. 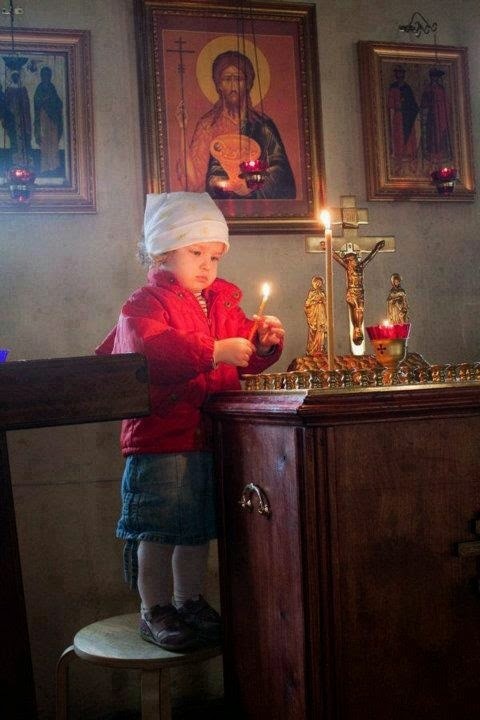 They then desire to be holy within themselves...here a little Russian Orthodox girl lights a candle with her white scarf neatly on her head. A beautiful lemon yellow lace mantilla by 'Robin Nest Lane', details in the side bar. A gorgeous collection of coloured, lace veils. 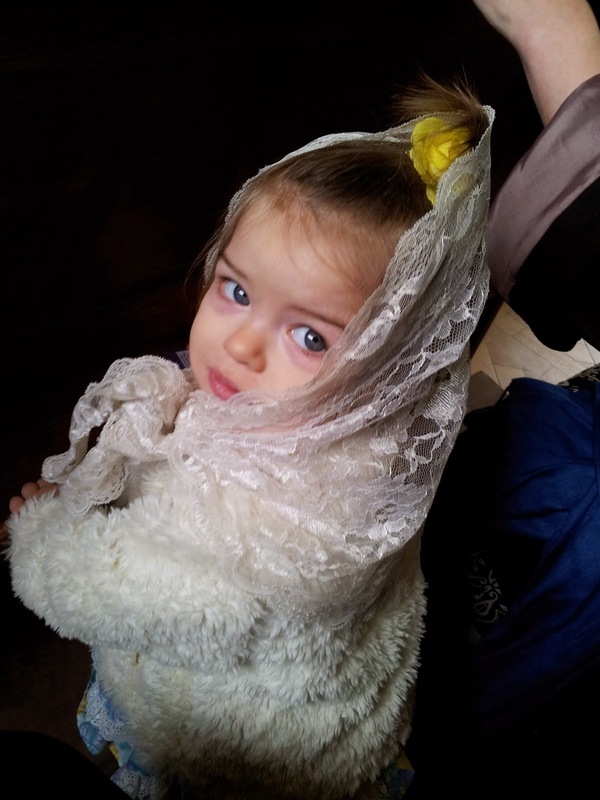 A small head peeps over the pew- a pale pink mantilla for this little one. 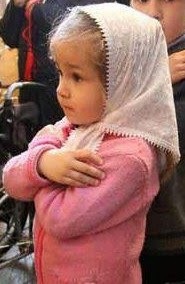 Even a toddler can feel the reverence a head covering allows. 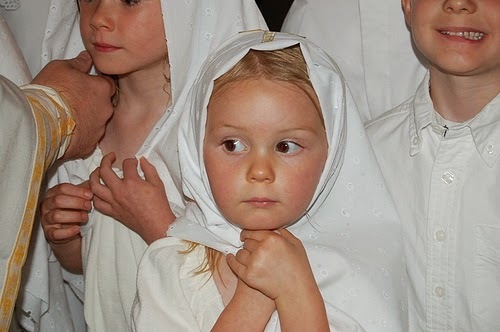 A sweet Russian Orthodox girl wearing pure white. 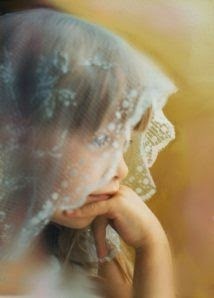 Grace Therese in her white lace mantilla at a Nuptial Mass. St Therese of the Child Jesus. 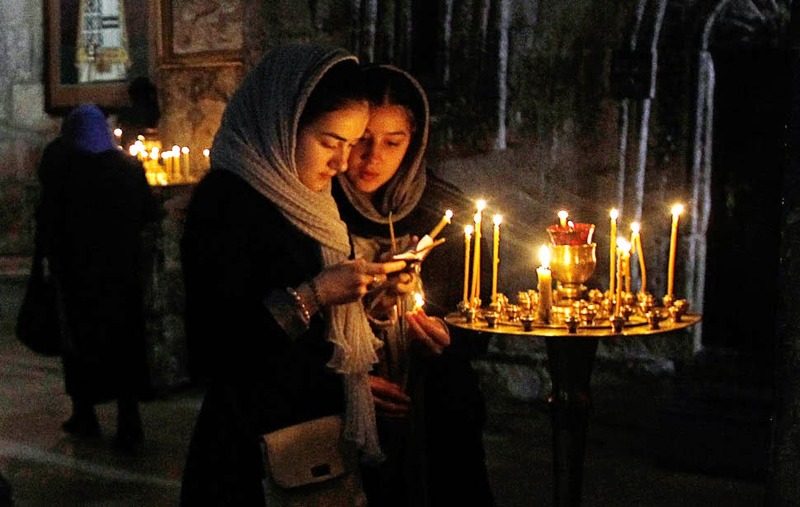 All Orthodox orders of Nuns still clothe themselves appropriately in full habits and veil. 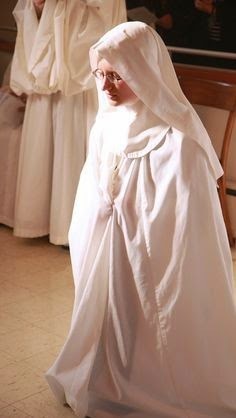 It is a beautiful sign of faithfulness and surrender to God to wear the habit of a religious order and one which is, tragically, not essential in some more modern orders. Before a lady makes her Solemn and final vows to sacrifice her entire life to Jesus, she will spend some time as a novice. She will deny herself earthly things and live within the chosen order. May God Bless the courageous and holy women who have given up their lives for Christ. 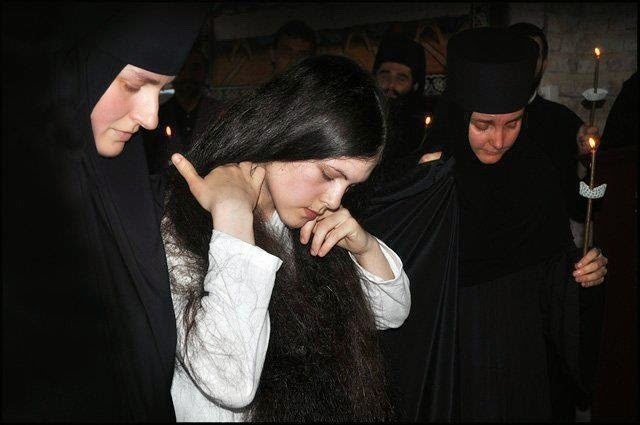 As her beautiful flowing tresses are cut off, this Russian Orthodox Novice prepares for her life with Christ and to receive her veil. 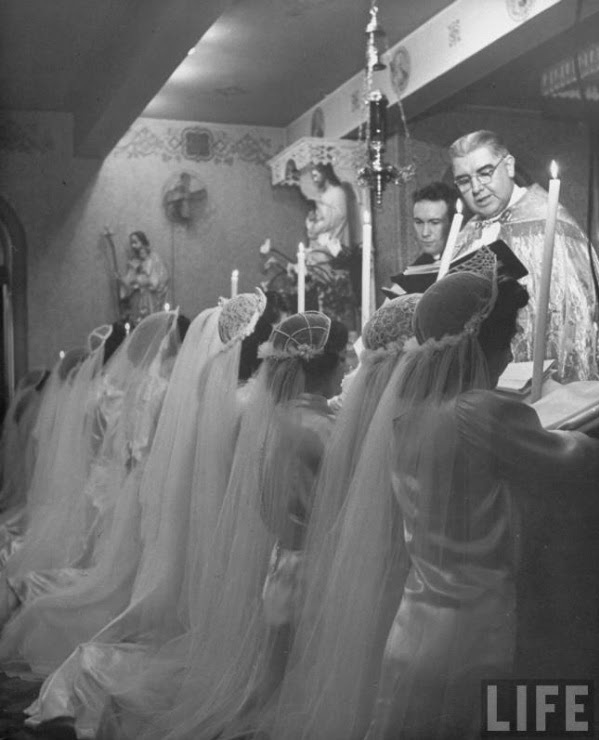 Carmelite Novices in 1944 wearing traditional bridal wear; a very beautiful sight. Making her vows in pristine white. Carmelite novices dressed as Brides of Christ. 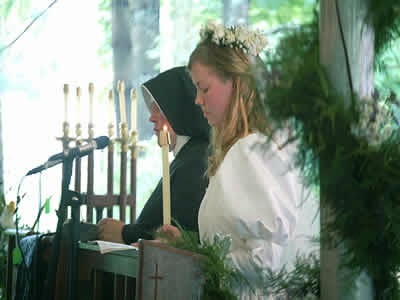 A lovely Bride of Christ praying with her lighted candle. 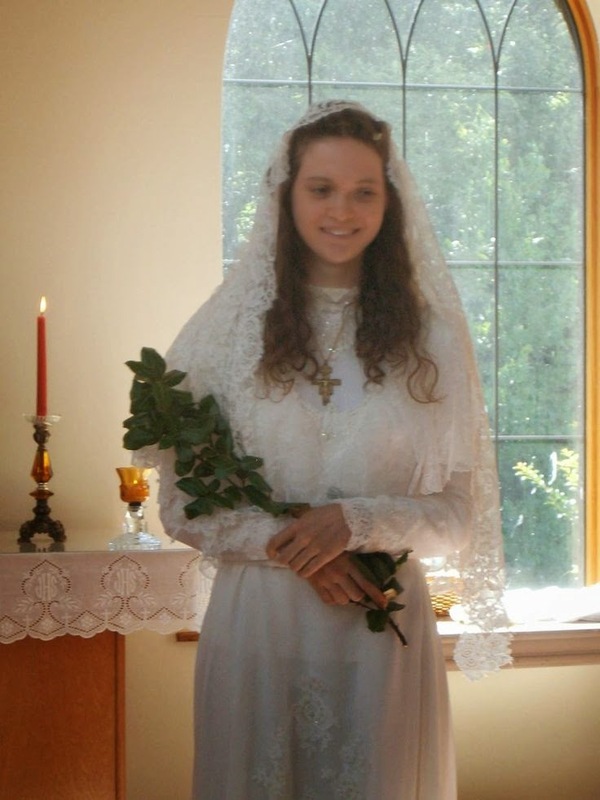 Sr Miriam Rose fully veiled in a Wedding dress after she made her vows as a Carmelite Novice. 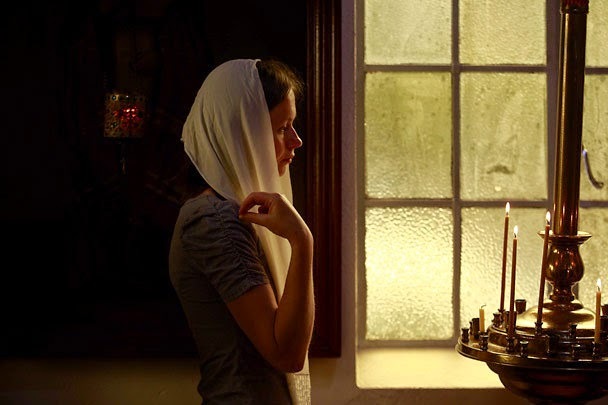 May God bless all women who selflessly give themselves to Christ Jesus. 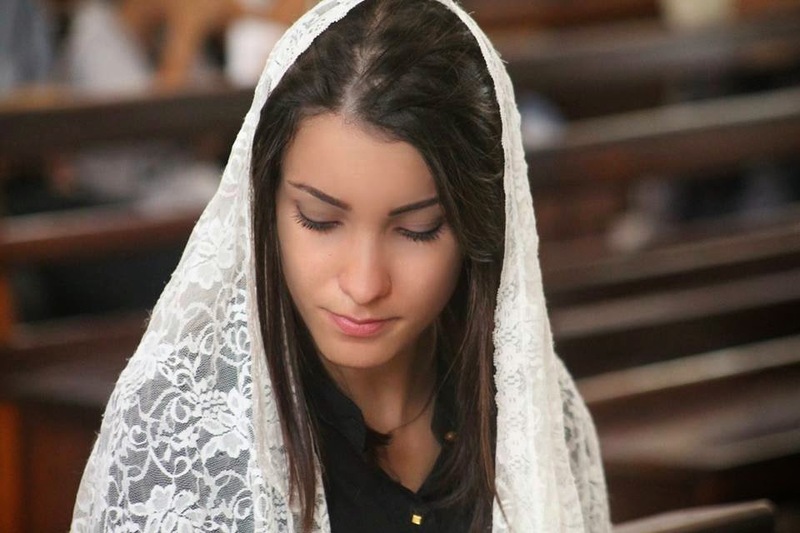 In my search for pictures of the mantilla, I noticed how startlingly beautiful the simple scarves and veils of the Eastern Orthodox ladies are. 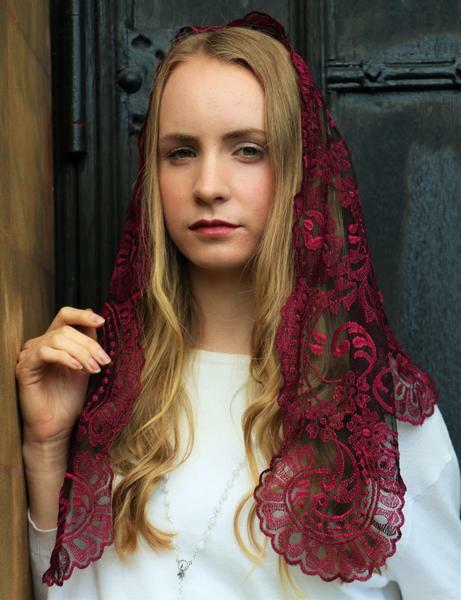 Having no classical mantilla to follow, they tend to don more colourful scarves and veils. They are always extremely modest and feminine in their attire and one can see their shining example upon their little daughters. 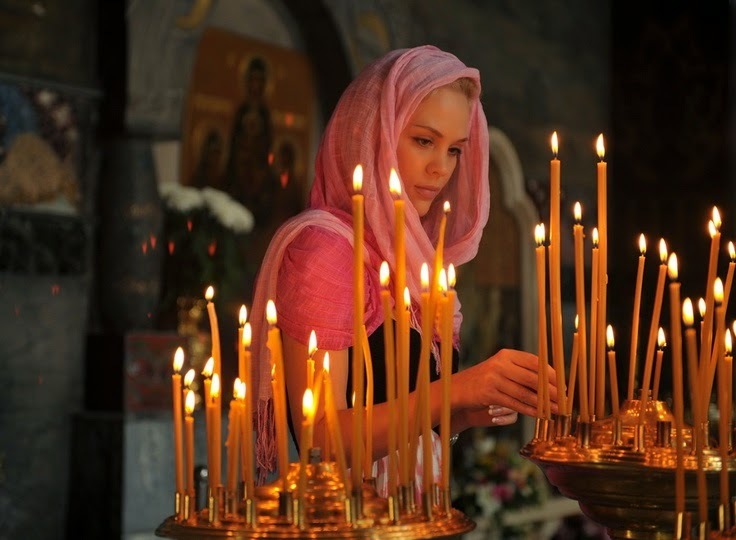 A simple, dusty pink scarf envelopes this lady as she lights a candle at a Russian Orthodox Church. Very plain, white scarf for prayer in Church. 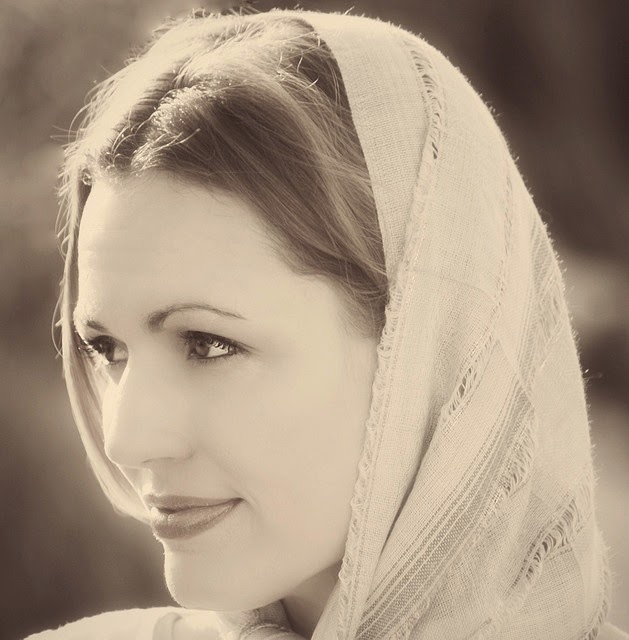 Many Eastern Orthodox ladies wear coloured plain scarves in place of the European style lace mantilla. This aquamarine scarf looks very modest and feminine. 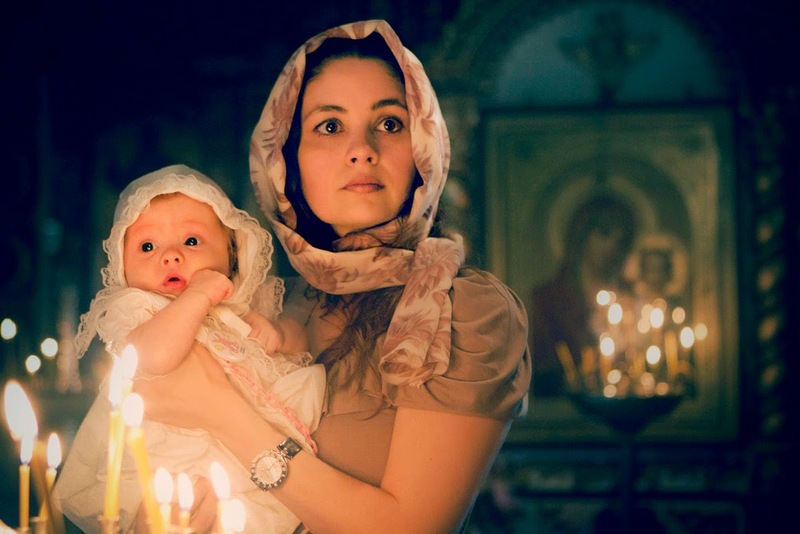 What a beautiful Mother and Baby photo in a Russian Orthodox Church. Mother wears a patterned scarf, baby wears a sweet bonnet. Two young ladies attired in scarves wrapped simply around them. Scottish purple High Mass set. Handmade Mantillas 100% made in Spain.